Don’t have a professional DSLR camera? That won’t stop you from creating great videos and taking professional photos with a Ring Light. Due to poor lighting, the viewers might perceive your best content in a bad taste. Enhanced lighting not only makes you look good but also improves the audience engagement. Now, you don't need to spend loads of money to add that professional studio like touch to your content. LiveStand™ is equipped with 3 brightness modes and a 24-inch long, strong arm that can bend to any angle,making your pictures and videos more lively and vivid. 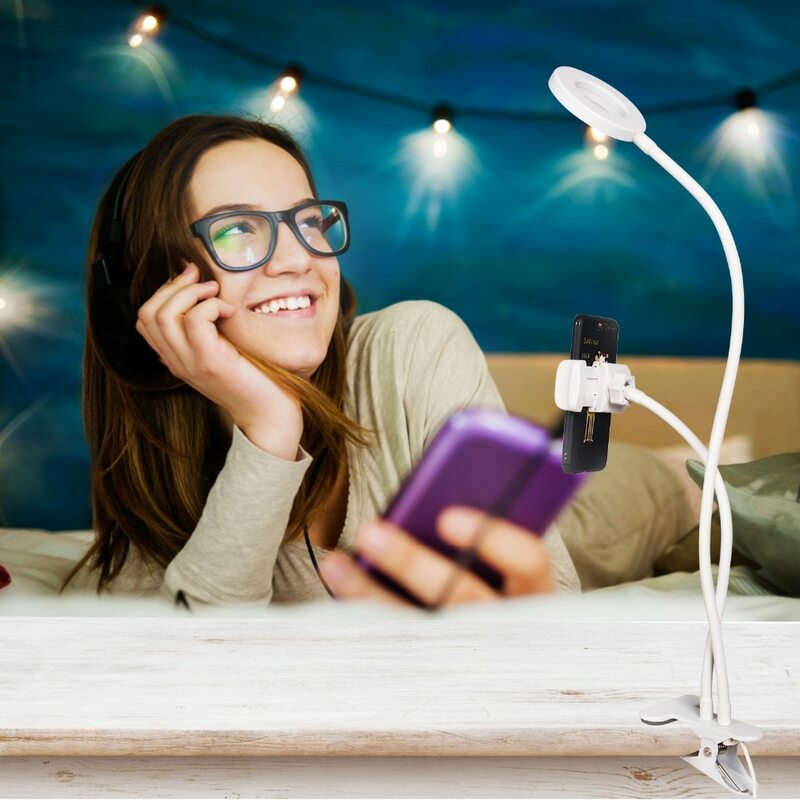 It is excellent for live stream, live broadcast, live show, selfie or video chat, or works as a cool light lamp at your home. The flexible goose-neck and joint design supports 360° rotation to give you optimal angle for selfie, live broadcast, reading, etc. With the cell phone holder and dimmable LED selfie ring light you can easily shoot videos like a pro. LiveStand™ is a professional tool which can be used during live stream, live broadcast, live show, selfie, video chat. It is perfect for YouTube, Facebook.live ,Blog, twitter etc. You can also use it as a cell phone holder or a light lamp in your bed room or living area. Now, you don't have to run around for perfect lighting. Instantly improve the quality of your pictures and video with 12 cold + 12 warm LED lights. LiveStand™ has 3 Light modes: White Light, Warm Yellow, Warm white and 10-Level Brightness. You can adjust the lights according to your requirement and enjoy the flawless experience. With LiveStand™, you don’t need anyone’s help to hold your phone during recordings or shoot. Free your hands with the rubber cushion clamp. It is anti-slip and provides ultimate stability, just clamp it on the table, adjust it to the desired angle and get going! LiveStand™ is compatible with phones smartphones which are up to 3.2 inch wide. It doesn’t need batteries and can be easily charged with a USB cable. It works with most devices that support USB port, like laptop, power bank,USB charger, and etc. Use the Control on cord to power on/off or switch to the lighting mode of your preference. The aluminium alloy body makes LiveStand™ stable and durable for long term use.